In 1925, the Hutt County Council built an open pavilion for visitors, on reserve land. After WWII, returned servicemen, with the support of the community, enclosed and upgraded the building for local groups to use for social activities. Early subdivisions of the seafront at Plimmerton did not allow public space for toilets, bathing sheds and shelter which were desperately needed for the large crowds of day trippers arriving to enjoy the beaches. In 1896 one acre of Māori reserve land, including the urupā, was reserved in perpetuity for descendants of a number of Ngati Toa people. (See site 23 Taupō No 2 – Taupō Urupā (Burial Ground)) Under pressure, particularly from visitors, the Hutt County Council took the lower part of this land under the Public Works Act and other legislation and erected the Pavilion as shelter for visitors in 1925. The building was three-sided with an open front. It initially created controversy, not only because of the land issue, but also because the Pavilion had no toilets or cooking facilities, faced directly into the prevailing wind, and was a distance from the more popular beaches. After WWII returning servicemen decided to fully enclose and upgrade the building to make it a more useful community venue. With the support of the Hutt County Council, they applied to the Department of Internal Affairs for ‘war memorial’ status for the Pavilion and a subsidy to assist the work. However, locals found themselves faced with considerable demands and ongoing delays. They told the Hutt County Council they would ‘go it alone’ and collected their plans from Internal Affairs. By this time, Internal Affairs had decided to approve war memorial status and a subsidy but it appears that the Plimmerton people had had enough. A year of community effort, working bees and fund raising saw the job done at no cost to taxpayers. The decorative windows along the front came from the Dalgety’s building in Thorndon Quay, thanks to Paddy Brayshay, a RSA member who had a prime role in this project. 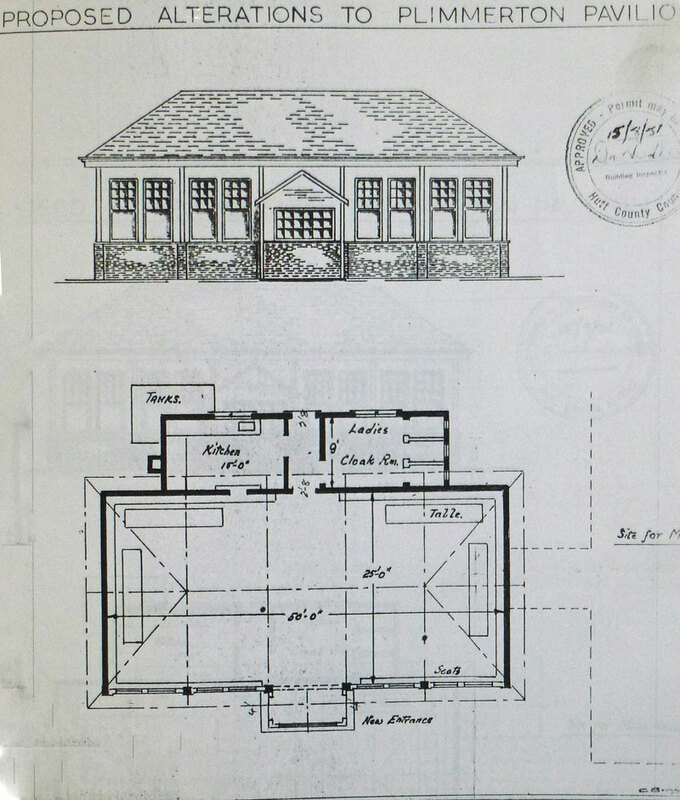 A Plimmerton Pavilion Hall Committee was appointed with responsibility for the ‘care, control and management of the pavilion’. This group included Albert Mildenhall (Chair), Paddy Brayshay (Secretary) and Frank Ross. Two hundred and fifty people attended the gala opening concert in November 1952. It was a grand affair with the theme ‘Time to Sing’. A free bus provided transport from Paremata and the NZ Broadcasting Service recorded the concert for a future broadcast. 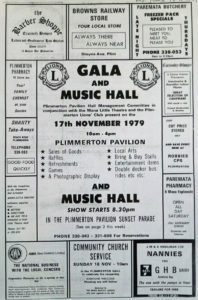 The Pavilion quickly became a centre for community events and activities, especially after the Theatre Royal burnt down in the Plimmerton shopping centre fire of 1954. Movies were screened there for many years. In 1967 a new committee was appointed, this time including representatives from various groups which used the building. The two RSA reps, Paddy Brayshay and Arch Dower, were the only former members who carried over to the new committee. Over the years the building has been upgraded. In particular, in 1979, the kitchen and toilets were demolished and replaced and a new supper room added. The old supper room was refurbished for Mana Little Theatre, including a wardrobe, shower and toilet. In October Mana Little Theatre moved their gear to establish their theatre behind the Pavilion after holding a final fling in the old tin shed at the school. As with so many of the village facilities, the hard work and commitment of countless local people ensured that the Pavilion remained a valuable amenity for community activities. © Copyright Plimmerton Residents Association and Plimmerton.nz 2016. Unauthorized use and/or duplication of this material without express and written permission from Plimmerton Residents Association is strictly prohibited. Written excerpts and links may be used, provided that full and clear credit is given to Plimmerton Residents Association. Photographs are owned by the original photographers and are subject to Copyright and may not be reproduced.